The only thing left growing in my garden is kale. I planted few varieties, but this year red russian has been my favorite. Maybe it’s the fact that it smells like raspberries to me (don’t judge) or the fact that the stems are purple and that’s my favorite color, but whatever the reason I have been all about red russian kale prepared every way possible. Sautéed, in soups, baked into chips, and raw in salads. While I like lettuce as bread subs for burgers and wraps, I have always enjoyed other greens as the base of my salad over the traditional chopped romaine or spring greens. I feel raw kale, spinach, or chard adds more flavor and texture to your average salad. The key to making a good raw kale salad is to message the chopped leaves before dressing, and always ALWAYS devein the leaves. Have I lost you yet? You’re not alone. Ripping veins out of leaves and then messaging them?! I’m not (totally) crazy, and it does make all the difference. The hard vein in the center of each kale leaf is very fibrous and doesn’t make for a great salad. Gently messaging the kale brakes down the stiff greens and turns them into a tender, flavorful base for your toppings. 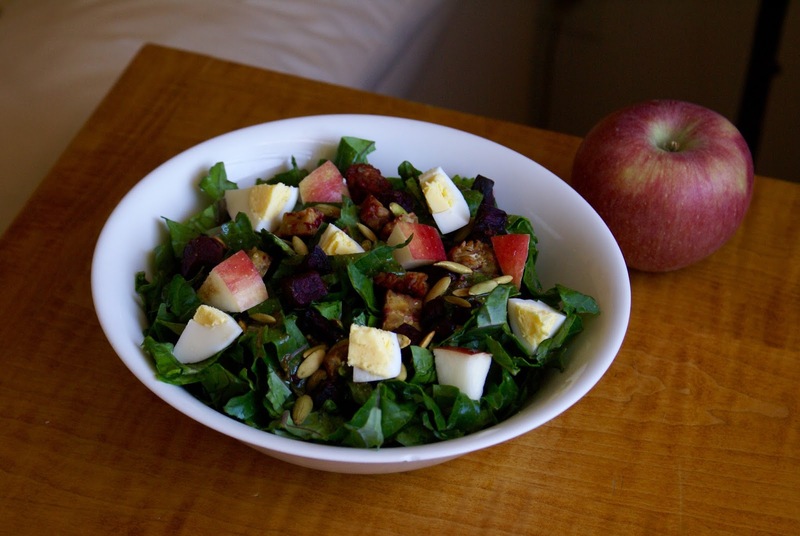 I went a seasonal route with my this salad, adding my favorite winesap apples and roasted beets. 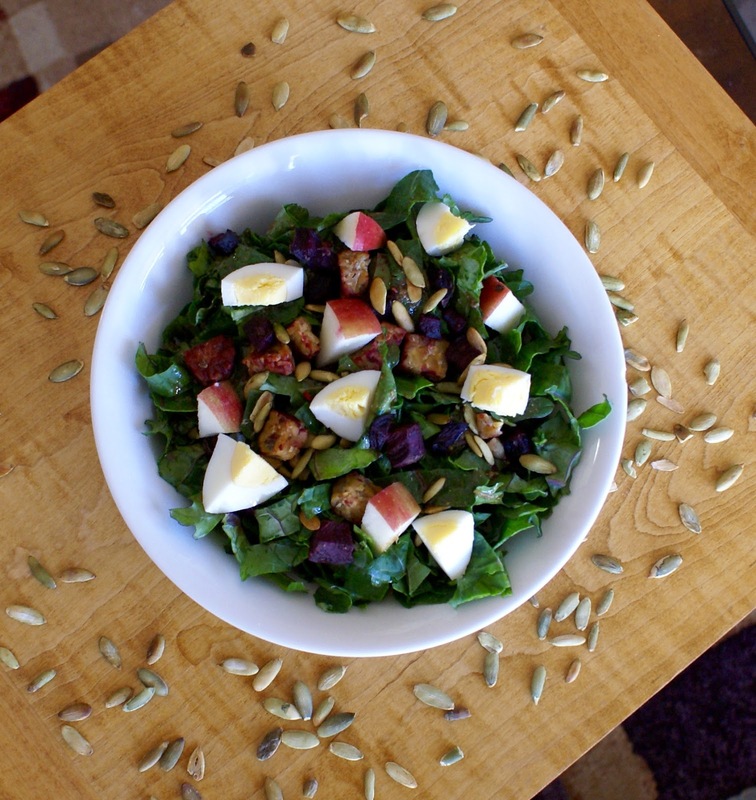 Nutty tempeh and hard boiled eggs add a hearty quality while pumpkin seeds give it a crunch factor. The whole salad is tossed in my favorite homemade balsamic ginger vinaigrette and makes a great light lunch or dinner side. 1. Preheat the oven to 400 F and line a baking sheet with tin foil and parchment paper. Dice the beets and tempeh, toss with the coconut oil, then season with the sage, salt and pepper. Spread out in the prepared pan and bake for 30-40 minutes, stirring every 10 minutes, or until the beets are tender and the tempeh begins to crisp up. 2. Devein the kale and chop into thin strips. Soak and drain well. When dry, add to a large bowl and gently message the greens. You want them to be tender and not stiff. 3. Toss with the dressing then top with roasted beets and tempeh, diced apple, diced egg, and pumpkin seeds. Store in an air tight container in the fridge.